At the weekend I was sold a new car with a ‘black pack’ which would be £2,500 more on than the standard but very much the same kit – I think it just meant I got a black grill on the front of the car, but it looked pretty so I was happy. I would call myself an aesthetic although several of my pals describe me in less favourable terms. So I was in my element to have received an invitation to the pre-launch of the new installation at The Gallery at Sketch. I absolutely adored the last enactment by Martin Creed and Sketch’s unique theme to commission the entire space of the Gallery to a notable artist to interpret the space, cutlery, crockery and lighting to platform their works and that of visionary Masterchef and part-owner Pierre Gagnaire. 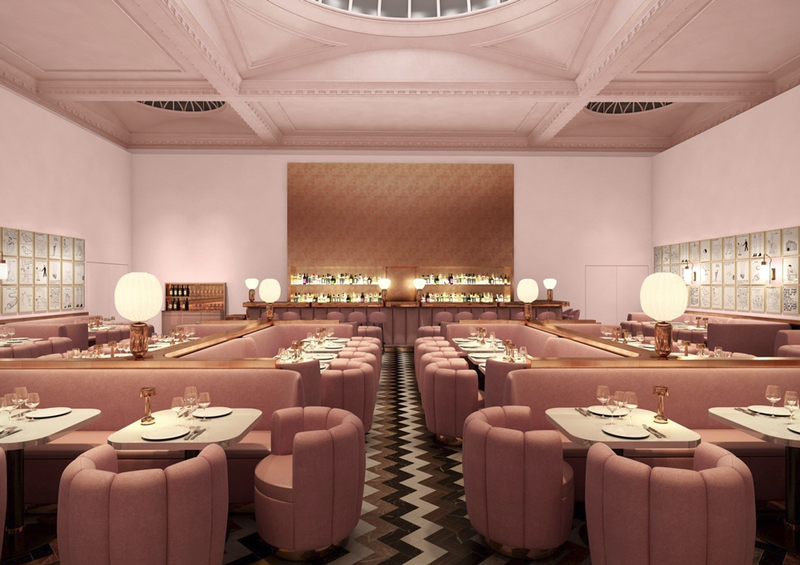 The new restaurant opens this Friday so this was a sneak preview of David Shrigley’s interpretation of the space. The room, a large exhibition room, has been deftly re-arranged from the eclectic-crazy-fun mix of having every chair, plate, table different to a smooth grown-up pastel affair. Flattering lighting, tonal colours pinks and gold and custom-made furnishings by India Mahdabi the Iranian-French designer and delicious smells by Diptyque have created a great canvas that brilliantly collide with the 239 original drawings of 45 year old British born, Turner nominated Shrigley that adorn the walls. Everything is up for sale – the jugs, plates, salt cellars, pictures and all black and white, comedic, simplistic and with a story-to-tell to the observer. The menu has also had some changes although favourites still survive. Gagnaire and his team love the shock value of mixing dishes that are unexpected but blend beautifully together, such as Crabmeat, tete de veau, squid with cucumber, and green apple water, gougere filled with creamy brandade. Vegetarian dishes were plentiful and the Rocamadour with kaffir line is a must dish. Start your evening in the Glade Bar at Sketch and soak up the warm energetic ambience of The Gallery. A fun night – I’m sold. Design Restaurants members dine complimentary at The Gallery at Sketch for dinner Monday, Tuesday and Wednesday when joined by at least one full paying guest. For for more details click here. (New restaurant listing goes live on Friday). Not a member? Why not download our free app and try our £10 for 10 day trial? Go to www.designrestaurants.com and click either android or apple icon.